Dental technology, just like in other medical fields, is growing and changing faster than ever, and fortunately, our team is able to keep up. We continually update our office with the latest tools so we can provide our patients with the highest-quality care in the least amount of time while keeping their comfort a top priority. Below, you can read about some of the fantastic tools we use every day. 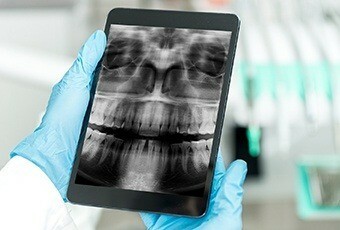 X-rays have been an essential part of dentistry for many years, and traditionally, they were made of film. 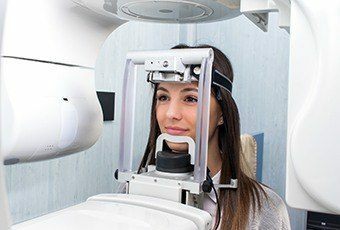 The process to create these x-rays has many drawbacks, such as the time it takes to actually develop the images, the harsh chemicals needed to do so, and the machine made many patients nervous because of the radiation it emitted. In order to improve this essential tool and give our patients peace of mind, we’ve upgraded to only using digital x-rays. They are an improvement in just about every way imaginable. They take much less time to create, no toxic chemicals are necessary, and the machine even emits up to 90% LESS radiation than a traditional one. Also, they can be instantly displayed on a chairside monitor and discussed with a patient so they can better understand their dental care. Plus, because they are entirely digital, they are infinitely easier to store, replicate, and transfer. 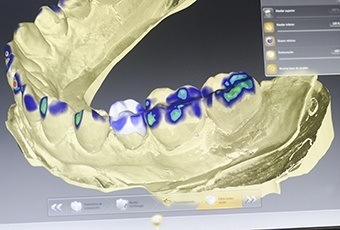 This machine allows us to create a fully 3D image of your teeth, jaw, and the surrounding area in order to more accurately plan your dental implant placement. With this kind of image, we’re able to adjust the procedure so that it works for your particular anatomy. We’ll be able to avoid sensitive nerves as well as place the implants in the precise location within your jawbone to get maximum support. This will not only increase your comfort during your procedure, but ensure its success as well. Have you ever had a bite impression taken with dental putty? If so, we bet it wasn’t exactly your favorite experience. It often tastes bad, and it causes some patients to gag. This is why we prefer to use digital impressions when possible. 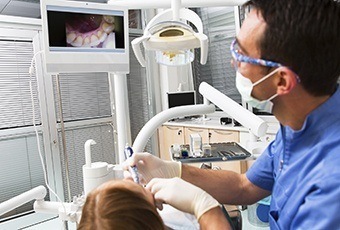 All a patient has to do is place their teeth on a small, handheld device, and within minutes, a completely digital 3D image of the teeth is created. This can then be used to precisely design restorations so they fit perfectly into a patient’s smile, ensuring they not only look great, but will last for a long time as well. 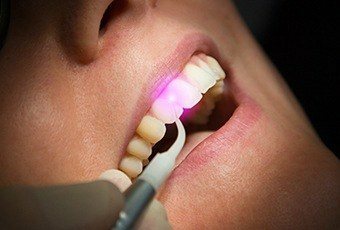 Dental lasers were first introduced into the field in 1994, and now, they are one of the most versatile tools we use every day. Our soft tissue laser can be used to perform sensitive periodontal therapy treatments and cosmetic gum recontouring, and it does it all with an unmatched level of precision. This is because the laser uses a highly-concentrated beam of light that can be focused on very small areas of tissue. It’s so accurate that it doesn’t affect any surrounding tissue, which not only reduces discomfort during a procedure, but also ensures an easy recovery as well. Plus, it cauterizes blood vessels as it goes, which reduces any chances of bleeding. In the end, if your dentist decides to use a soft tissue laser to treat your smile, you can sit back, relax, and count on your treatment being over before you know it. The Velscope will play an important part during your oral cancer screening. This light will highlight any tissue abnormalities that could indicate cancerous cells that would normally be invisible to the naked eye. This enables our dentists to catch oral cancer even sooner, which is excellent because early detection is key to successful treatment. Thanks to this tool, you can trust that this disease will never catch you off guard.